Groundsel Tree, among others. The male tree has small golden globular flowers bearing short yellow stamens that deliver pollen to visiting insects. This is a valuable source of food for late-season insects – syrphid flies, wasps, bees, and even grasshoppers have been seen feeding on the rich nectar and pollen. When the female fruits are fully developed, the male tree is inconspicuous, the flowers withered and indistinct. Research has shown the plant may be wind-pollinated also, the percentages of success being about equal for both methods. This tall shrub can grow to 12 feet, with many branches. The wedge-shaped leaves can persist through early winter, long after flowers have faded. Groundsel tree thrives in full sun. It can be somewhat weedy, but its roots hold the soil, preventing erosion in wetlands. It grows in freshwater and waters that are brackish, and can colonize roadsides, ditches, old fields and other disturbed areas. Closer to the water’s edge, will be Marsh-elder or Sumpweed, (Iva frutescens). Before the flowers appear, Groundsel Tree and Marsh-elder can be distinguished by their leaves. The lance-shaped leaves of Marsh-elder are opposite on the stem whereas those of Groundsel Tree are alternate and wedge-shaped. Marsh-elder is much-branched, growing to 8 feet, and can be somewhat leggy. 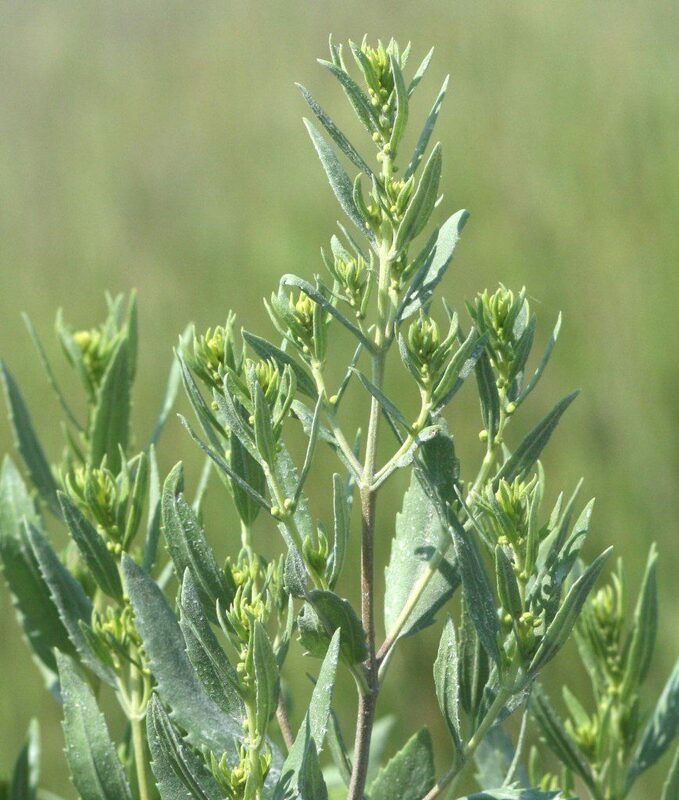 Tiny nodding, greenish-white flower heads appear along the ends of stems, each accompanied by a small leaf-like bract. Blooming from August through November, the flowers are followed by dark, rounded fruits. 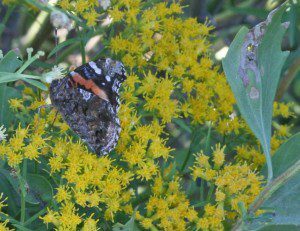 Both plants are members of the Aster Family, related to sunflowers and goldenrods. They usually grow on upland borders of salt marshes where continuous flooding does not occur, but exceptions can occur where they grow in ditches and canals. Marsh-elder is often nearer the water’s edge, providing nesting habitat for birds such as the red-winged blackbird and the marsh wren. Bayberries, (Morella spp.) are a third group of shrubs or small trees often growing at the water’s edge. Pocosin Bayberry (M. caroliniensis [Myrica heterophylla]) and Wax Myrtle (M. cerifera) are more tolerant of wet soils than Northern Bayberry, (M. pensylvanica). With proper identification of these species, botanists and ecologists know the nature of the underlying soils. 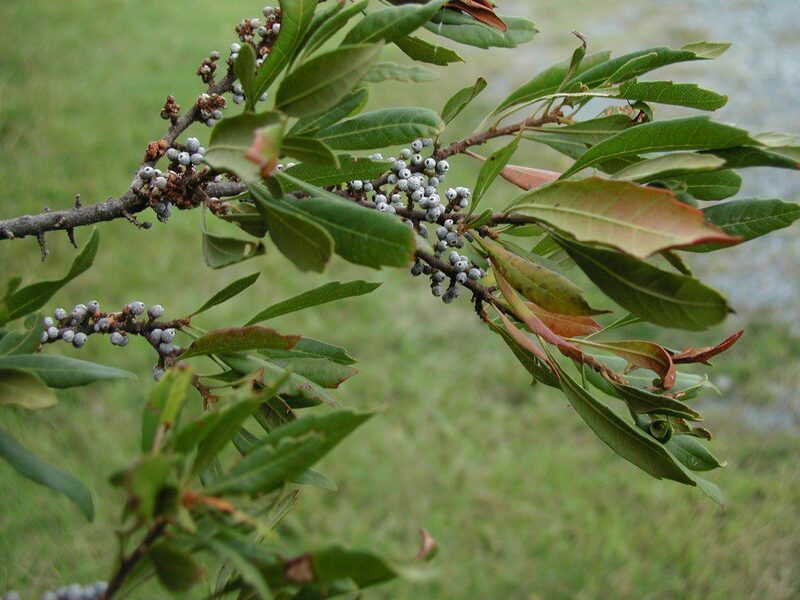 Wax Myrtle, or Southern Bayberry, can be a shrub or even a tall, gangly tree, growing vigorously, and spreading by rhizomes. 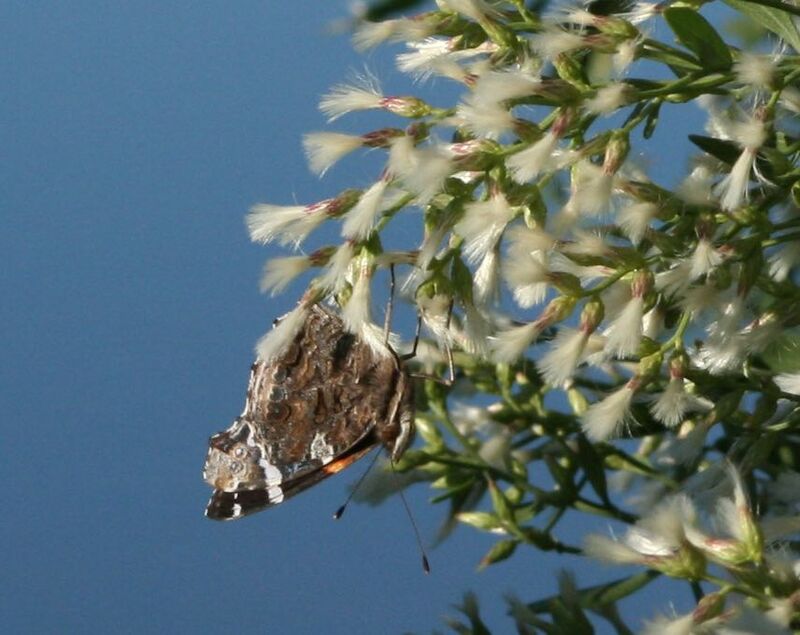 With regular pruning, this dependable native can be an excellent screening hedge. This species is common everywhere in the Coastal Plain. The evergreen leaves, mostly 4-6 times as long as wide, furnish winter habitat for small mammals and birds. The copious fruits with waxy coverings provide fuel for migrants and fat for over-wintering birds. Northern Bayberry is a shrub, growing to 6 feet, in drier habitats such as dunes and open inland sandy forests. It is a maritime species, common in the outer Coastal Plain on the Eastern Shore and in Virginia Beach city. Larger leaves are about 3 times as long as wide; they are deciduous, but hold their leaves into winter. The twigs are more or less smooth and the fruits are somewhat larger than those of Wax Myrtle. Pocosin Bayberry, (Morella caroliniensis) likes the wetter soils in bogs and peaty swamps. It occurs south of the James River, but is rare in the northern Coastal Plain. Its leaves are about three times as long as wide, more or less evergreen, but unlike the other two species, not fragrant. The twigs are densely hairy. Early settlers used the fruits of bayberry species as a source of wax for candles and soap. Myrtle (Yellow-rumped) Warblers are so named because they are often seen in these shrubs. They are winter residents in our area, able to survive on the fruits of juniper, poison ivy, and these bayberries. This has given them a large long-term advantage over most of our other warblers and many other birds which make increasingly perilous journeys to winter in the topics, where there is massive habitat destruction.